"This is truly a 'tart' tart! Lemon pudding, cream cheese and confectioners' sugar create a tart filling. 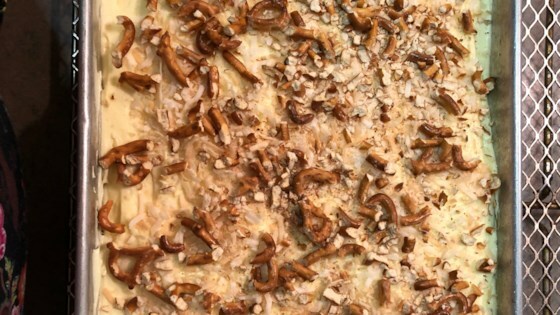 The pretzel crust lends a salty flavor." In a mixing bowl, thoroughly cream sugar and butter. Mix in pretzels. Press mixture into a 9x13 inch baking pan. Cover and refrigerate. Prepare lemon pudding mix according to package instructions. In a separate bowl, beat together cream cheese and confectioners' sugar. Fold in whipped topping. Spread cream cheese mixture over top of pretzel crust. Then spoon lemon pudding over cream cheese layer. Cover and refrigerate until pudding is set. This was a big disappointment. The lemon pudding had too little taste. Lemon curd might be better. This is off my list.